One of the things that I love most in this world are books. Whether big or small, short or tall, it matters not. I love books and I tend to read and devour them very quickly. With this love for real books, comes a love for polymer clay books. I must have 100 polymer clay books, likely almost every book ever written! This being said, finding a polymer book that stands out from the crowd can often be daunting. 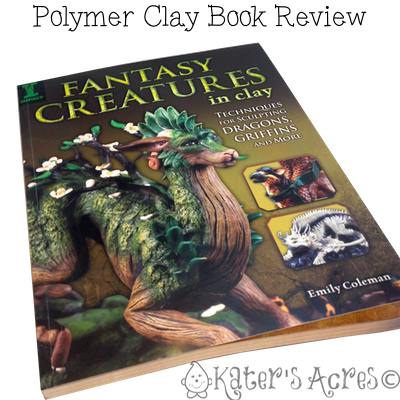 This book Fantasy Creatures in Clay by Emily Coleman is a different type of a book. It is not a project book or a tutorial book. Rather, this book is detail driven. There are few books that do a good job portraying realistic fantasy creatures. Some of my favorite include Fairies, Gnomes & Trolls by Maureen Carlson and FaeMaker by Dawn Schiller. This book in no way compares, as there are no real projects in Fantasy Creatures in Clay. So if you are looking for a book that’s includes a “let’s make a gryphon” tutorial, this is not your book. It contains detailed elements of the process, but nothing more. No full projects. I saw this book back in June on Amazon and actually ordered mine as a pre-release as I was so excited. It’s available there now with free shipping (if you have prime) for just $15.40! (CLICK to purchase now) All the major basics of creating a design are covered in the book: from armature, to wings, to finishing details. The forms & details that are used to create these beasts are dramatic, over the top, and yet realistic. Please understand when buying this book, you are not buying a book filled with different tutorials on how to make any specific creature. Rather, the aim of this book is show you how to go about doing it, from beginning to end. It is up to the reader to come up with a figure, design it, add wings, horns, & other details. If you are looking for a book that says, “First make a ball of clay, then roll it into a teardrop” you will be disappointed. There are more individualized instructions on wings, horns, bodies, & making the wire mesh form, but it is up to you to come up with the ideas to make your own. You will learn how to make feet (paws), create scales, realistic eyes, fur, & some other crucial details. Again, you must come up with your own creature. This being said it’s a great starting point. Explore the world of clay and learn to create the dramatically beautiful forms of some of the most fearsome and awe-inspiring creatures your imagination can conjure. Ranging from ferocious dragons to regal griffins to magnificent underwater beasts–they’re all here! Inside you will learn simple techniques for creating realistic individual parts of fantasy creatures. Wings, horns and bodies–everything is covered here. Then you will discover innovative ways for assembling those parts to form characters straight from your imagination! From start to finish, you’ll learn everything from brainstorming creature ideas to making the armature and building the body with clay to baking and mounting the creature onto a base. Everything you need to know to build your very own mythological menagerie! So immerse yourself in these easy-to-learn demonstrations and practice the skills necessary to create realistic wings, paws, scales, fur, facial expressions, poses and so much more! This is a great book if you already have sculpting ability & a full, creative imagination. If you are looking for a “ready made creature” to make from this book, you aren’t going to get it. I wish more details was given into coming up with design aspects (there are only 4 short pages devoted to this with little text & lots of graphics). However, the details on wing construction, armature construction, & painting details are thorough, even for an intermediate. This book is not for a beginner, it is for someone who is experienced in claying & sculpting. Out of 5 stars, I gave it 4. You can read my Amazon review here. Do You Have Something You’d Like Reviewed? Is there a product you’ve been wondering about? Do you want to know if you should buy it? Do you want to know if it’s worth the hype? Are you a company who wants your product reviewed? Leave your comments below or contact me here. I do not own this video or the content within. DISCLAIMER: This is not a paid endorsement. I purchased this book with my own money from Amazon. Links go to Amazon where I am an affiliate. Thank you so much for reviewing my book! I am really glad that although it was not what you expected, you did enjoy it and took away something from reading it. For the bonus material, I wanted to let you know that there is more coming, including some content that was removed from the first edition of the book. Hopefully it will be up soon! Emily, Thank you SO MUCH for letting me know that there was additional content coming. That does make me happy. I love your work, you are SO talented! I did enjoy your book very much, yes not what I expected, but I did learn a lot of tips & tricks that I didn’t want to post so others could purchase the book & read them for themselves. Thank you stopping over to the blog.